Now my regular readers around here know that I do enjoy tea but I can't claim that green tea is necessarily my favorite. It's the kind I drink when I feel a cold coming on (or if I already have a cold) but it's not usually something I seek out for its own sake. Also, I am a huge fan of tea bags and haven't dabbled much with blending and seeping and whatnot. I'm interested in doing so, but I haven't yet worked up the courage. (I understand it doesn't take that much courage but on some things I move in baby steps.) That explained, tea is tea and if ever I'm given a chance to try a new kind I find it hard to pass the opportunity by. Now, I did not have all of the special equipment listed in this video. I do not own a bamboo whisk, for example. However, I did put the power through a strainer to break up any clumps. (There weren't many clumps, by the way. This is a beautifully blended powder as-is.) I whisked in the "m" motion as prescribed until my tea was nice and foamy. My boy and I sat down to taste test and, sure enough, it tasted like a brilliant green tea. It definitely has a stronger more natural green tea flavor than you'll find when using ye olde tea bag. I began to believe the word "premium" on the label. This tea is most definitely green and shares an appearance with green foods powder. As I raised the cup to my mouth I speculated that was what I was going to be tasting, but not so. I tasted green tea - just in its more pure form. 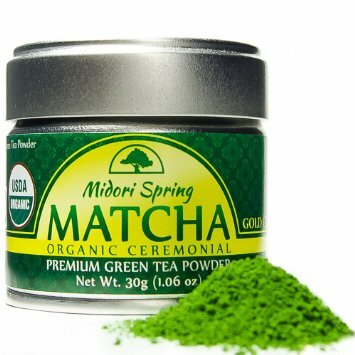 I looked up the benefits of drinking Matcha Green Tea and among the many things it claims to do for you (increased memory, weight loss, etc. ), I discovered that Samurai, (the noble warriors of medieval and early-modern Japan), drank Matcha Green Tea before going into battle due to the tea’s energizing properties. I suppose what's good for the Samurai is good for the stay-at-home mom. Except that this stay-at-home mom has a few more modern conveniences to make life easier and so felt justified in adding a little honey to her cuppa. I don't know that Samurai would approve but no matter. The honey took the edge off of the strong green tea flavor which, as I've said, is not necessarily my favorite but which I do have now and again. By the time I was near the end of my cup I found myself adjusting to the stronger flavor and really enjoyed it (with my dollop of honey). If you love green tea for medicinal purposes or just for an energizing drink, you might wish to consider this Midori Spring Organic Ceremonial Matcha - Gold Class - Premium 1st Harvest Japanese Matcha Green Tea Powder . It won't be my go-to but it will be enjoyed every now and again. I received a sample of the above tea from Life and Food Pro. through their Amazon program. I received no additional compensation and all opinions are my own.